Originally published in Contributoria Magazine, August 1, 2015. Five years on from the catastrophic earthquake that decimated Haiti, many are still waiting for their lives to recover. Meanwhile, repeatedly postponed elections are finally looming this month, yet are already mired in controversy. For the country’s young people, there’s a desperate need for a change in the business of Haitian politics. Jacques Michel, a thirty-nine year old Haitian social worker pauses with weary resignation as he looks down at his budget plans for this summer; he knows he’s in for a big job. We’re in Cap-Haïtien, Haiti’s second largest city, on the country’s north-eastern Atlantic coast, and home to 190,000 residents crammed into it’s incredibly overcrowded streets. It’s extremely hot and hectic. And with the congestion, comes thousands of vulnerable children, out of school and begging on the streets. “I want to help show them that they can live differently, if they have more opportunities,” enthuses Mr Michel. He explains his plan to run a summer camp this year for over a hundred children, who he knows often rely on scrounging on the streets to eat. They are all of school age, but many skip classes regularly. When asked why, he says that Haitian state-run schools are plagued with inefficiency. Rampant government corruption and teachers not getting paid on time, means that children can go to school, only for there to be no one present to teach them. The persistence of such unreliability results in some parents and children preferring to stay on the streets instead. Hustling for food or money seems to be the preferable option. 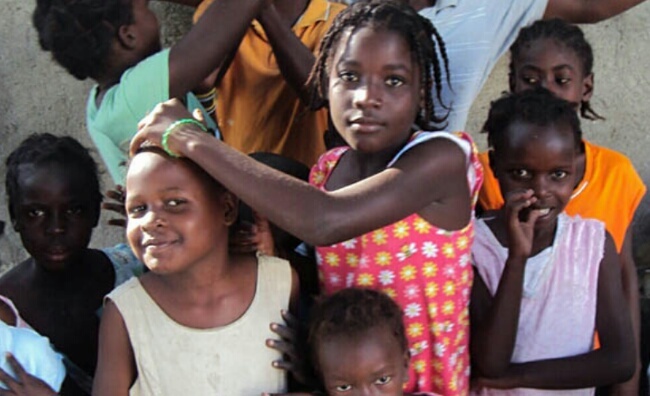 Haiti remains in crisis five years after being brought low by the devastating 2010 earthquake. 220,000 people were killed. 1.5 million people were made homeless, including children, and thousands clearly remain so. Others have managed to get just one step up, into a shanty temporary structure with no water, sanitation, electricity or idea of when they’ll be able to live in a permanent house again. Indeed, talking to Haitians, you get a strong sense of their frustration at the government’s inability to improve their quality of life. Professor Eduardo Gamarra is a political scientist at Florida International University. He was also an adviser to former Prime Minister Laurent Lamothe, from 2012, until he was pushed to resign in December 2014. This has a knock on affect on nearly every part of society. It’s an uninspiring situation that’s clearly reflected in Haiti’s literacy rate of 48%. And even when these children grow up, their prospects don’t improve much either. With such high unemployment, the country’s economy shows little sign of growth, making Haiti the poorest country in the whole of the Western Hemisphere. For Professor Gamarra, the suffering that so many young Haitians endure, being consigned to chronic joblessness right from the start, is indicative of Haiti’s toxic political legacy. There are even signs of this instability on the streets. From the moment I crossed the Dominican Republic border into the country, I saw dozens of heavily armed UN peace keeping troops, alert and standing aboard armoured vehicles rolling through town. The troops are a vestige of the paramilitary coup that ousted President Aristide in 2004. 11 years on, they still stand watch. Decades of disillusionment with Haiti’s political class means that Mr Michel says that increasingly, he sees the outside world of charitable donations and international volunteers, as being more influential to the futures of his children. And that’s not all. Mr Michel is concerned that the lack of government investment in Haitian schools is shaping children’s attitudes to life. It’s as if they are growing up with the expectation that they will not be able to provide for themselves fully; that going from one hand out to another is a normal way of life. For Mr Michel, it’s a disturbing realisation, especially, as he’s witnessed how far some children are willing to go to get their next payment. Through his former work in the community as a priest’s assistant in the Orthodox Church, he saw how easily vulnerable children can be abused. And that’s what he hopes to do. His summer camp focuses on the basics of language, especially French but also English. The majority of Haitians only speak Haitian Creole, an amalgam of French, west African languages and Taíno (an extinct Caribbean indigenous language and people). As the official language in formal situations is still French, for the law and courts, official documents and the media, this has caused problems for many Haitians. However, it’s not easy, with no support from the government, other than providing him with a license for his charity. And so, the problem, as ever with charitable endeavours, is where the money is going to come from. As of September 2013, $13.5bn in foreign aid had been pledged to Haiti, and so far, it’s mainly been coming from the U.S., followed by EU institutions and then Canada. But, perhaps a more pressing question is where has the money gone? Analysis over the last two years has been damning. In 2013, the U.S. Government Accountability Office (GAO) released a report that was highly critical of the way the United States Agency for International Development (USAID) had been managing aid allocated by the U.S. Government. Of the $651 million approved by Congress since 2010, USAID had only disbursed 31% of the funds. The GAO scathingly noted that of all USAID money that had been spent, the cost category with the highest disbursement rate was ‘Operating and Other Expenses’; in other words, overheads. In 2012, the Center for Economic and Policy Research highlighted another key problem in the global aid industry, namely the heavy reliance on foreign contractors. It analysed all the 1,490 contracts awarded by the U.S. Government after the earthquake until April 2011, and found only 23 went to Haitian companies. Out of $194 million, this amounted to only $4.8 million. In comparison, contractors from just the Washington D.C. area received $76 million. The lack of local procurement led to contracts being handed out to some organisations with a questionable grasp of Haiti, it’s politics and priorities. In a 2011 Rolling Stone article, Glenn Smucker, an anthropologist who specialises in Haiti, decried the obvious naivety of one New York-based consulting firm called Dalberg Global Development Advisors, which had won a $1.5 million contract. He claimed their team didn’t have disaster or urban planning experience and only one member spoke French. Yet one of their tasks was to assess the viability of a large swathe of land, with the hope of building new communities. Belatedly, after sending their own experts, USAID realised that the Dahlberg team may either have been hopelessly out of their depth, or never have inspected some of the sites in person. One of the areas they said was habitable turned out to be a mountain with an open mine cut into it and a 100 ft vertical cliff. However, despite anxiety over where pledged money ends up, Haiti continues to heavily rely on foreign assistance. Eric Stransky, is a white Haitian hotel owner, who lives in Pétionville, an outer suburb of the capital Port-au-Prince. He returned to Haiti nearly four years ago, after living abroad in Bali and the U.S.
“The influx of funds after the earthquake, however mismanaged, did help,” he insists. Part of the problem is that Haitian politics has been on a slide into stagnation for at least the past four years. Crucial elections have been repeatedly put off for three years, which left parliament’s mandate to expire in January this year. This has effectively enabled President Michel Martelly to rule by decree. There are hopes that this will change soon – municipal and parliamentary elections are finally now scheduled for August 9th, with a second round due on October 25th, to coincide with the presidential election. Yet, already, serious accusations of fraud are flying thick and fast. Not everyone is so pessimistic. Back in Cap-Haïtien, Jacques Michel is in the midst of planning for the arrival of a hundred children at his education camp, and is still hopeful that the next few months will pass without violence. The outcome of the machinations of his country’s political elite could have a profound impact on the future prosperity of his charges. He knows they’ve already been let down. Still, he believes his government can do better. If the West’s eyes are indeed turning elsewhere, at the same time as Haitian politics continues to fracture, the future doesn’t bode well for Mr Michel’s children, even as they work to try and improve their prospects. All hopes must now rest on the ballot box, rather than the charity tin. Thanks for this blog post regarding Haiti; I really enjoyed it and am definitely recommending this blog to my friends and family. I’m a 15 year old with a blog on financial markets and economics at shreysfinanceblog.com, and would really appreciate it if you could read and comment on some of my articles, and perhaps follow, reblog and share some of my posts on social media. Thanks again for this fantastic post.